I’m going to make a very bold statement here–soon China will dictate global fashion and will have more influence than Paris, Milan, and New York City will. Obviously, this isn’t happening this year, nor will it happen next year, but given the macro and micro economic factors that will drive China’s growth coupled with the country’s billion-plus population, fashion companies are already paying very close attention to the country. By 2020, China’s affluent population is expected to reach 270 million, making the Chinese fashion market the largest in the world. The Chinese population already has an affinity toward high-end fashion, and China’s consumers are more than eager to spend a lot of money on Western fashion brands. Michael Kors Holdings Ltd (NYSE:KORS) plans to open 100 stores in greater China in the next three years in cities such as Beijing, Shanghai, and Chengdu. Michael Kors currently has a dozen or so locations across China and has aggressive marketing and expansion plans in place. This will pay off in a few years when the relatively young Chinese population enters Kors’ target market with disposable income ready to be spent on luxury items. Michael Kors Holdings Ltd (NYSE:KORS) is known for its high-end bags, shoes and accessories. Its target market is typically professional and successful 20-to-35 year-old women. Michael Kors Holdings Ltd (NYSE:KORS) recently launched a Chinese website and adorned some of the most famous influential Chinese celebrities with Kors’ clothing and accessories. Source: Jing Daily: Model Shu Pei Qin decked in head to toe with Michal Kors. Judging by recent financial results, Coach, Inc. (NYSE:COH) is struggling with its faded, old, “passé” image in North America and Europe. 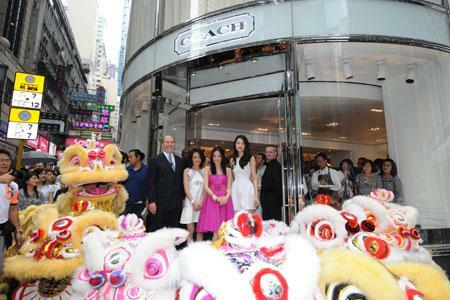 Analysts are missing the fact that Coach, Inc. (NYSE:COH) is amongst the largest and most popular luxury retailers in China. In the first three months of this year, Coach, Inc. (NYSE:COH) proved its dominance in the Chinese market by increasing sales by 60%, while global sales only grew 17%. Analysts are estimating sales in China to exceed $400 million in 2013, up from around $300 million in 2012. With over 100 locations in China, and a recently expanded offering to online retailing, Coach, Inc. (NYSE:COH) is perfectly positioned to continue dominating the Chinese market through its advanced multi-distribution channel. Source: Jing Daily: Coach marketed towards Chinese clients. The popular American retailer The Gap Inc. (NYSE:GPS) has ambitious plans to expand its many different lines to China. Old Navy and Banana Republic will soon be available to Chinese consumers, as currently Gap has 33 stores under its flagship name.